There are a huge number of mattress shops in the Atlanta area. We’ve put this guide together to help you narrow down the best places to buy a new mattress near Atlanta. If you’re not sleeping well, you’re not living well. We’ve all heard studies about the powerful impact of rest on immunity, weight, stress levels, and even life expectancy. It turns out that sleep also determines the quality of your day-to-day functioning. A recent study conducted by the National Sleep Foundation found that of adults with excellent sleep (8+ hours of quality rest per night), 90% reported that they are “very effective at getting things done each day.” Those with poor sleep? Only 45% reported the same level of efficacy. One factor that can make all the difference between deep, restorative rest and poor-quality sleep is a good mattress. A separate poll by the same source found that 92% of adults agree that a good mattress is essential to good sleep. If your mattress is more than 8 years old, you’re overdue for a replacement. Experiencing back pain, snoring, night sweats, or insomnia? It may be time for an upgrade. There are plenty of options these days when it comes to buying a mattress, from simple and affordable mattresses, to mattresses with smart technology that allows them to adjust to postural changes throughout the night. There are mattresses made from gel, foam, and even all-natural mattresses made from latex, cotton and even coconut fibers. Before making a purchase, you’ll want to research your options, and a great place to start is with our guide to the best places to buy a mattress in Atlanta. We’ve compiled the most well-rated mattress shops in each neighborhood to help you decide where to buy a mattress that fits your comfort needs and budget. Read on and get on the road to better rest- and better quality of life- today. Located right in the heart of Downtown Atlanta, Original Mattress Factory (3360 Satellite Blvd) is a well-established place to buy a mattress in North Atlanta. This popular chain retailer operates their own mattress factory in each city where they have a retail presence, allowing them to stock locally-made mattresses in each store, and offer factory direct prices. The company is so confident in the quality of their materials and manufacturing practices that they actually allow prospective customers to book factory tours at any facility. Shoppers have equally high confidence in the store, giving Original Mattress Factory 4 stars on Google and Yelp. Customers appreciate the wide selection, which includes models at different price points, from basic to luxury. There are quite a number of excellent places to buy a mattress in North Atlanta. One of the highest-rated of these is Simmons Mattress Outlet of Atlanta (1335 Chattahoochee Ave NW). This no-frills, warehouse-style outlet retailer sells Simmons brand mattresses exclusively, one of the nation’s most popular mattress brands. The store has earned an impressive 4.7 star average rating on Google, with customers citing incredible discounts of 50-70% on pillow top, memory foam, or BeautyRest mattresses. 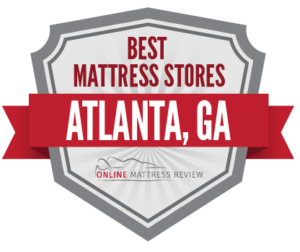 Another highly-reviewed option is Atlanta Mattress (3651 Piedmont Rd NE), a locally- and family-owned mattress shop which stocks a wide variety of mattresses. Atlanta Mattress’ inventory includes luxury brands like Vispring and Tempur-pedic, as well as affordable mattresses from economy lines like King Koil, and a wide variety of organic and natural mattresses by such popular brands as Latex Bliss. For those who prefer the security of shopping at a chain store, Original Mattress Factory (3230 Peachtree Road) has another highly-rated location in North Atlanta in addition to their downtown showroom. Finally, Relax the Back (3330 Piedmont Rd NE) is the go-to mattress store in North Atlanta for those experiencing back pain. The store specializes in ergonomic furniture and mattresses designed specifically to deliver relief to those experiencing discomfort or needing special postural support. The store stocks therapeutic gel mattresses, special elongated and wedge-shaped pillows, massage beds, adjustable bases, and a wide array of top-of-the-line Tempur-pedic mattresses. Relax the back is staffed by a chiropractor and personal trainer, who offer special insight into customers’ comfort needs and guide shoppers to therapeutic sleep solutions. With a five-star Google rating, the Bed Loft (565 Metropolitan Pkwy SW) is a great place to buy a mattress in South Georgia. This no-frills retail outlet sells discounted, name-brand mattresses, including coil, memory foam and hybrid options. For those in the market for both a mattress and bedroom set, Ben’s Mattress and Furniture (1432 Moreland Ave SE) is another economical option, which specializes in affordable mattresses draw from overstocked inventory. Here, customers can get free delivery and a 90-day trial on innerspring, memory foam, hybrid and pillow top mattresses. For those who don’t want to spend all day mattress shopping, Mattress Fast (3030 Headland Dr SW) is an excellent solution. Reviewers on Yelp give this mattress shop an average of 4.5 stars, citing outstanding customer service. In addition to mattresses, the store stocks pillows, bed sets, frames and adjustable bases. There are no less than three locations of Mattress Firm in East Atlanta: Mattress Firm Edgewood (1221 Caroline St), Mattress Firm Midtown (650 Ponce De Leon Ave NE), and Mattress Firm SuperCenter & Clearance (2112 N Decatur Rd). As the nation’s leading mattress retail chain, Mattress Firm has a solid reputation for wide selection and expert customer service, and each location has an average customer rating of 4 or more stars. While Mattress Firm offers a wide selection, Colgate Mattress (779 Fulton Terrace SE) is highly focused on delivering a single specialty product: baby and toddler mattresses. Colgate boasts a 4.8 star Google average rating, and is committed to offering the highest quality and safest crib mattresses available. Customers looking to buy a mattress in West Atlanta have fared options than elsewhere in the city. Mattress Firm has another location in Southwest Atlanta, Mattress Firm Camp Creek (3755 Carmia Dr SW), which has earned an impressive 4.9 star average rating on Google. Reviers cite outstanding customer service from the staff of “sleep experts,” who are trained to assess each customer’s body type, sleep style and comfort preferences to refer them to the right mattress. Independently owned J & R Mattress (2560 Donald Lee Hollowell Pkwy NW) is a no-frills mattress shop located in the Northwest, with affordable prices, and a solid 4-star average customer review average. Finally, Southern Nights Mattress Company (130 Selig Dr SW) is a mattress factory which sells both commercial and consume4r products. Customers in search of a locally-made mattress can pick up a new model at factory-direct prices, and even take advantage of Southern Nights Mattress Company’s mattress recycling service to dispose fo their old products. That brings to an end our guide to the best mattress stores in Atlanta, Georgia. Good luck as you shop!